I've finally found out why my Fowler tank was sold as a non runner. 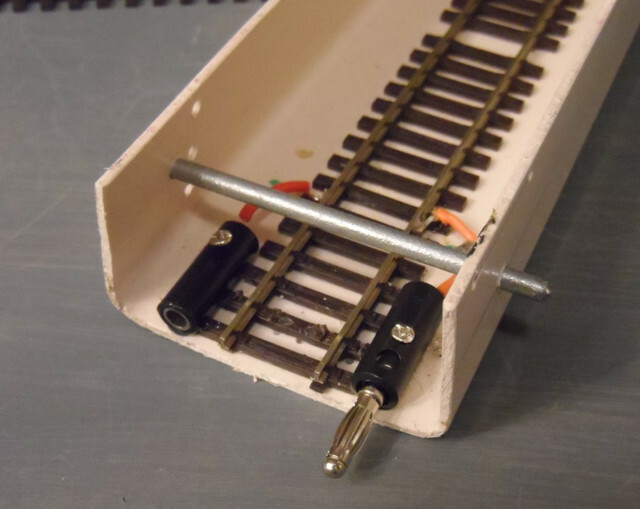 I'd done a repair on the underframe using MEK and small (0.5 x 1mm) straps. This is a bit fragile but once assembled seems to hold itself together. Gently reassembled the chassis and tried it on the track - nothing. 15 minutes head scratching and playing with a multimeter and realised the wheels were on the wrong way round. I know it wasn't me (thats my story) as I only took the front and rear drivers out but left the centre ones fixed to the rods with the small screw. At that point I gave up for today as the underframe had to come off again and I guessed my MEK repair might fail and wanted a good run at it. Last edited by dougalmac2 on Fri Nov 17, 2017 7:34 pm, edited 1 time in total. The underframe repair must have been stronger than I thought. Took it off again, turned the wheels round, refitted coupling rods etc and tested. Ran round my oval nicely. What was highlighted was that I have one point that the pony truck doesn't like and runs off up the wrong line, but all others were OK. 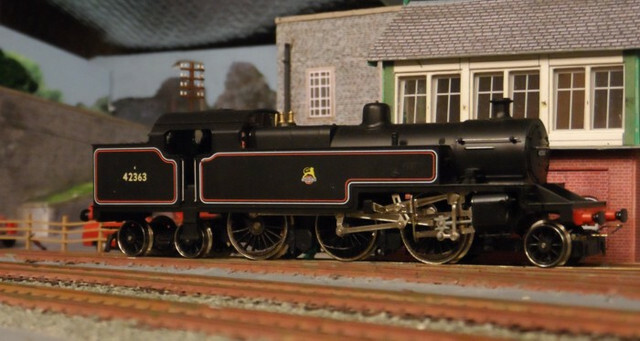 I had exactly the same thing with a Hornby Ivatt 2MT 2-6-0 recently on this same point. They're both fairly old locos with coarser than current wheels but it only happens on that point. That bit of track hasn't been ballasted so its not rubbish in the frog. Whether they've both got a back to back problem or whether its just the Hornby twin pivot pony truck problem as noted by quite a number of people on this forum. Note to self - Must get a back to back gauge. I've now got one of my favourite locos on the layout even though slightly limited at the moment. Last edited by dougalmac2 on Fri Nov 17, 2017 7:36 pm, edited 1 time in total. If it happens on just one point I'd take a real good look at it, try putting a straight edge across the frog area. Over the years I've had quite a few that have a high spot in the middle of the frog and require additional pinning down to make sure they are flat. It's a greater problem with code 100 than it is with code 75. Thanks Bufferstop, I'll check that tomorrow. Bufferstop - I checked the point in question but it looked perfectly level. Just in case, I tried fixing it more securely to the baseboard, which also checked level, again with no joy. There don't seem to be any irregularities on the line up of the track either. Thanks for your suggestion though. It's obviously something to always keep in mind. I have noticed Bigmets attack on this problem on another post ( viewtopic.php?f=16&t=51301&p=629649&hilit=Pony+truck#p629649 ) and will try that. Watch this space. My latest service job. Bought this last year at a show as a poor runner. Just love these ringfield tender drive locos, so easy to strip down. Took the tender top off and just the same as the last one. Too much oil all over the place including sticking a brush in the holder. After a good clean gave the loco valve gear and rods a clean and slight touch of oil and the loco free wheeled for a couple of yards after a gentle push. Connected it all up, and gave it half an hour running round and its fine, well at least as fine as I'd expect using a fifty year old H&M controller. I bought this intending to respray and renumber/early emblem it but at the moment I like it like this, especially as its got all the 'bits' and a crew fitted. Going back to the previous post, this loco runs perfectly through the point in question. Last edited by dougalmac2 on Fri Nov 17, 2017 7:45 pm, edited 1 time in total. The ringfield 8F with its "firebox glow" is also a favourite of mine. Hi GWR Fan - I haven't noticed if this one has that, it is shown in the service sheet so I'll have to look later. I must be honest I only stripped the tender as the loco seemed to roll freely. Timbersurf - I was particularly taken with your idea of using banana plugs and sockets so purchased some from the two sources you gave me. Thanks very much for that. 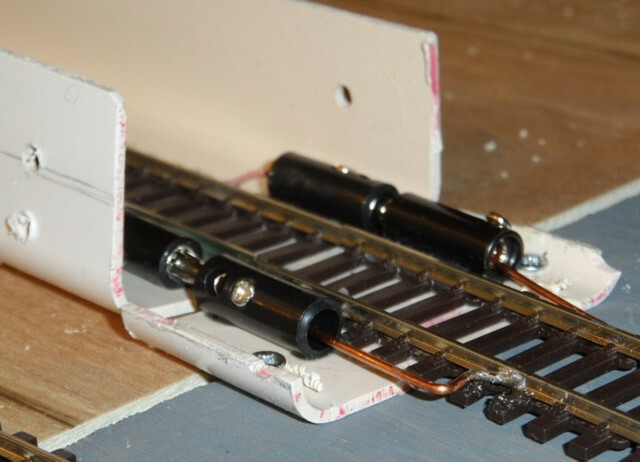 which gives me accurate alignment of the joining of the rails without any fiddly measurement. I used the same adhesive as you suggested and, so far, it seems solid. I'm experimenting using a push-in limiter at the ends and at the moment this is a 3 1/2" nail with with the point rounded. 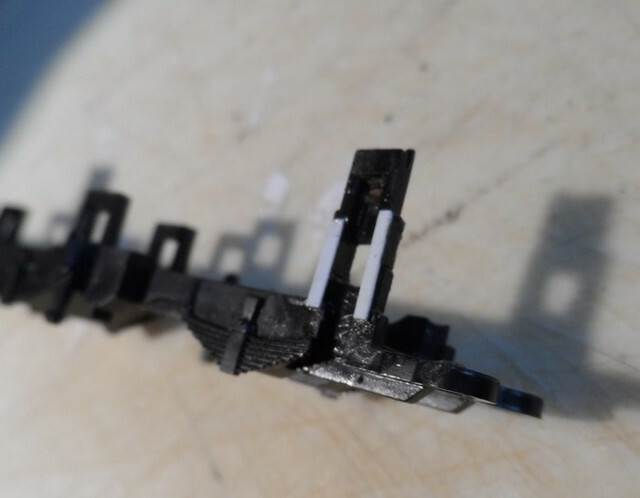 I did think initially of a styrene plate that dropped into a slot but this seems simpler. Last edited by dougalmac2 on Fri Nov 17, 2017 7:49 pm, edited 1 time in total. I hate these photos that make you look a right amature. The swarf from drilling is bad enough but I don't know where the solder splatter came from. Must fix those. As usual posted before doing a complete check. Found that some of the steps on my ringfield tenders were fouling the plugs and sockets on the cassettes. 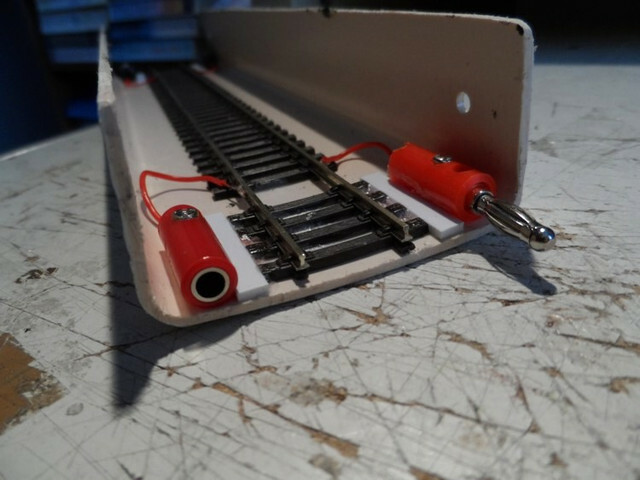 Luckily I hadn't completed too many so was able to solve by inserting a strip of 5mm styrene between the sleepers and the plugs/sockets. Completed testing properly and all now good.